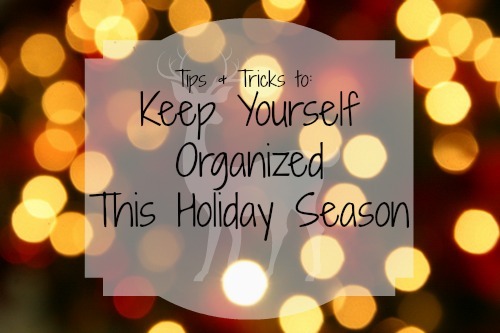 Getting yourself organized for the Holidays can be, well, excruciating. And I always feel like I'm waiting until the last minute to wrap gifts (literally on Christmas Eve some years). But this year, everyone will be bought and paid before this week is even over! I even have all the gifts I've already bought wrapped! I did a few things to make this Christmas go over a LOT smoother! » Make a list - and check it twice! » Make a Budget for each person! Once you've got a finalized list - make a budget for each individual person! I usually cap friends at $20, close friends at $30-$40. I average ~$50 per family member although I have a tendency to splurge on my Gram (hello, $100 Estee Lauder purchase). My fiance has a ridiculous budget, I don't know why. I usually put around $100 into his budget because I will win the present buying competition. My dog gets a budget too, a little $10 that I spend on squeaky toys to only be used at Grandma's' house. Shopping on Black Friday or Cyber Monday + the beginning of December gets you some great deals and some time to think! The last few days before Christmas are ridiculous - so I'm avoiding the malls/stores at all costs by getting done as early as possible. USPS has this wonderful thing called 'if it fits, it ships' flat rate boxes that are affordable and you can shove as much crap in there as it can hold. Wrap your gifts ASAP (or throw them in bags with tissue paper, I don't judge) and get them shipped out. The sooner the better because the post is going to be slammed with all the holiday boxes.